These are the most central hotels in Boston, best for sightseeing on a first visit: Boston Common, the Freedom Trail, Faneuil Hall Marketplace, the Aquarium & more. 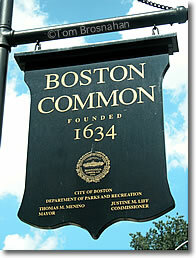 Boston Common is the center of life in Boston, as it has been for centuries. If you're coming to Boston for sightseeing, consider hotels near Boston Common first. Most of what you'll want to see in Boston is within walking distance of these hotels, and most of the rest, including train and intercity bus stations, major art museums, Harvard Square and Cambridge, are on direct subway lines from Boston Common's Park Street Station, the central crossroads for Boston's MBTA subway (Metro) system. The Visitor's Information Center is on the Common, as is the start of the Freedom Trail. Boston Common is a big 50-acre (20-hectare) park. These hotels are located around its edges, each with different advantages (and disadvantages). Its name is its address: 90 Tremont Street, a 4-star, 190-room modern hotel next to historic Tremont Temple, right across the street from the Old Granary Burying Ground, and one block from Boston Common and Park Street Station. Government Center is a few minutes' stroll northeast along Tremont Street. Look also at hotels on Beacon Hill, hotels in the Theater District, and hotels near the Public Garden.